Shivaji Raje’s dream of the swaraj came true with the crowning ceremony (coronation) on jestha shuddha 13, the year 1596 of salivahan shaka. With this the SHAKA (an era) of Shivaji started. Really it was the dream of Maharashtra that there should be a king like Shivaji Maharaj. It was not only the dream but the real and powerful truth. He formed his own Swaraj (Hindu Patpatshahi) proudly called as Shivshahi. Working hard as there was not a real ruler before. Samarth Ramdas has described his leadership as Marathi word LAGBAG. (Hurry and Bustle). 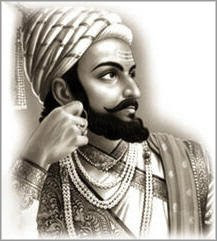 Ramchandrapant Amatya has said that Shivaji Maharaj created the kingdom from Ahivant to the Kaveri by getting knowledge from the enemy and by defeating it. Shivaji Maharaj had many virtues, the Good character is one of them. It is much essential that a king must possess virtues and Shivaji Maharaj really deserved. He had qualities like Adventure, Alert, Fearless, Respect for Religion, Bravery, Patience, Determination and Justice. In his life he had to face many hardships, but he overcame them successfully. His escape from Agra was a strange situation, Using intelligence he brought his men home safely. Just imagine the distance from agra to raigad! With only eight elephants, 500 soilders and from the distance of 1500 K.M. without losing lives, all of them came safe and from the custody of Aurangzeb!How Shivaji Raje killed Afzalkhan, is described by kavindra paramananda. He says that Shivaji cut his head in two parts. The picture herewith showing the situation we must say Shivaji Maharaj created the kingdom the real atmosphere. He spent his childhood in pune at LAL MAHALnear about it, is the Kasba Ganpati temple, Kedareshwar Narayaneshwar mandir, Punyeshwar mandir, pune coat & Nagzari Frisking and playing in such atmosphere Shivaji Maharaj successfully became the king of Maharashtra, He bought Maharashtra, Self rule, self religion(Maharashtra Dharma)self language. This is the memory of our pride. This entry was posted on Monday, July 5, 2010 at 5:59 AM . You can follow any responses to this entry through the comments feed . Hey Rohan Even I would love to know about history from you.